We try our best to make food that is Paleo and that our children can eat. Since we haven’t always been perfect at eating Paleo, our children know what it is like to eat “regular” food. Let me tell you, my children LOVE chicken tenders. 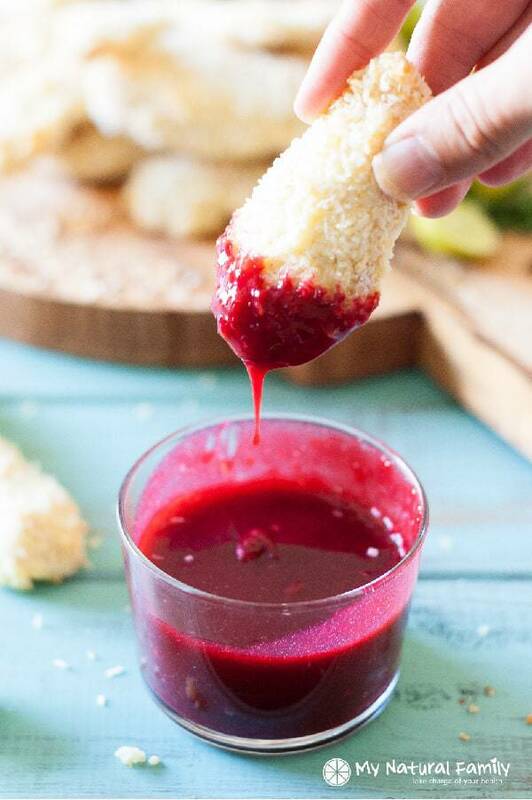 And I love restaurant-style coconut shrimp, so I decided to blend two of our favorite dishes into coconutty-breaded goodness with a side of sweet chili lime blackberry dipping sauce. That’s how I came up with Paleo coconut chicken with dipping sauce. It is a good way to get your children (or you) to try blackberries and they are delicious with some sweet and spice added to it. It’s a favorite for sure, and it makes an easy weeknight meal. 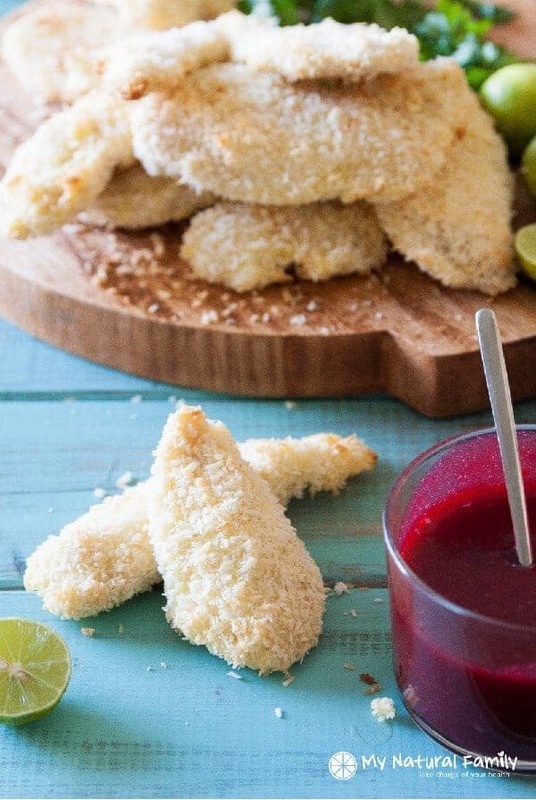 If you have eager helpers in your home, let them take over the job of rolling the chicken tenders in shredded coconut and laying them on the baking sheet. It will keep them focused while you work on other kitchen tasks. Plus, I’ve found that children who like to help cook food like to eat food they make, even if they weren’t sure about it to start with. Another recipe I have created that is on our blog for our children is Paleo Mac and Cheese. My daughter just the other day was talking about how much she loves the cheese sauce and she actually thinks it’s real cheese in the sauce, but it’s not – it has veggies in it! And I happen to think that Paleo coconut chicken and mac and cheese go great together so you may want to try this winning combination tonight. What do you think? Would your children be willing to eat this Paleo coconut chicken? Preheat the oven to 375 degrees F. Line a baking sheet with parchment paper or a baking mat. Place the coconut flour in a shallow bowl. Set aside. Whisk together the eggs, honey, salt, and tapioca starch in a shallow bowl until well combined. Set aside. Place the shredded coconut in a shallow bowl. 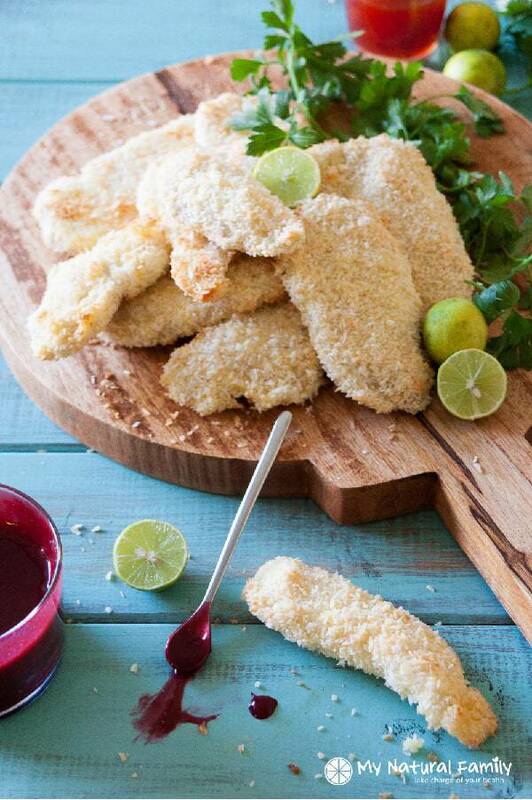 Coat the chicken tenders in the coconut flour. Working with one piece of chicken at a time, dip the chicken in the egg mixture and then coat it with the shredded coconut. Place on the baking sheet. Repeat with remaining chicken. Bake chicken in the preheated oven for 15-20 minutes, until cooked through and coconut is lightly golden brown. Puree the blackberries in a blender and run through a fine mesh sieve. Discard seeds and pulp. 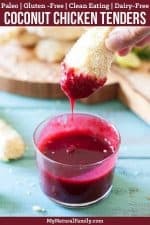 Whisk the blackberry puree and tapioca starch together until smooth. Add the honey and the rest of the ingredients except the lime juice and whisk until smooth. Bring just to a boil over medium/high heat. Mixture should thicken slightly. Remove from heat and whisk in the lime juice. Serve as a dipping sauce with the chicken tenders. The recipe isn’t there anymore it takes you to Garlic Parmesan Chicken Tenders. 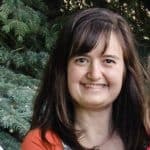 I even did a search on her blog and nothing. I just thought I’d let you know. I’m so glad you brought that to my attention. You helped me figure out she took it off her blog so now I added the recipe to my blog and you can get it. I hope you like it! Would the coconut crust work for shrimp ya think?